a car park at Plaça de Espanya on the Northern end of the city center. And while parking there was calculated by minute, we paid less than 11€ for 5.5 hours which I think is ok. The good thing about stopping there was that you first pass the big market hall “Mercat d’Olivar” which is well worth a visit. We hadn’t had breakfast so we stopped at one of the many mini bars that mostly sell tapas and had a bocadillo, a sandwich, and a cortado, a small espresso like coffee with a bit of milk. 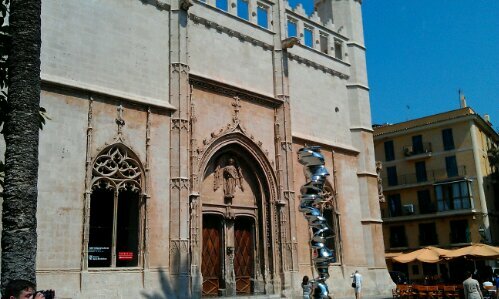 Then we walked down through the shopping district towards the cathedral, passing the not so exciting Plaça Mayor and getting the chance to had a look into some inner yards of old Palma’s city houses. The closer we came to the cathedral the more crowded it got. This is because it is the touristiest area and because it directly connects with the port all those cruise ship passengers, and there were quite a few ships in the harbour, come to the city and the cathedral is the first thing they get to see. We decided not to queue to get into the cathedral nor to spend 9€ to get into the royal palace and made our way up the hill again, this time taking in the big boulevards. On one of the main shopping streets is in middle of normal shops a feudal town house that houses the Fundació March. 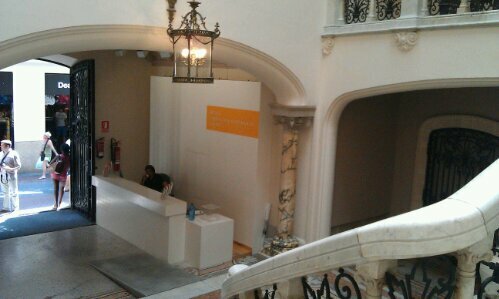 This small museum has some extraordinary pieces of modern art and even if you are not into art that much it is free which means some precious minutes of air conditioning and free and clean toilets. Then we headed for lunch. We wanted something away from the tourists. We had to look a bit. Obviously many people from Palma like to go on holiday in August too: many places were either completely closed or not open on weekends. 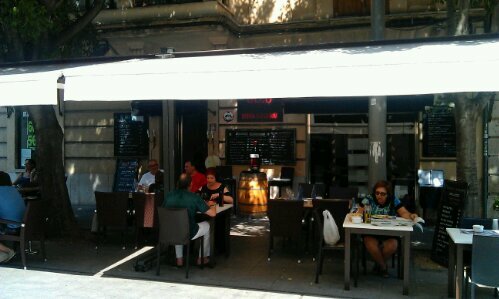 We finally ended up in the Bodega Blanquerna 8 close to Plaça Espanya. Here we had a very nice three course lunch for under 10€ each as Spanish restaurants are obliged by law to offer one cheap lunch menu and this one was really good and most guests chose it and they were all Spaniards (always a good sighn for me). And after another cortado we made our way back to the Finca. It was just too hot to do more sightseeing. 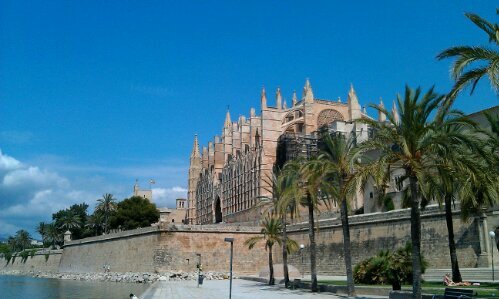 This entry was posted in Spain and tagged History, Mallorca, Summer by kathatravelling. Bookmark the permalink.